Torch: So you're a friend of his, huh? Tony: Look man, that's my [expletive deleted] man. We go back like car seats, baby, there's too much crime and too much time. Laurence (then Larry) Fishburne began his acting career way back in 1968 in the soap opera One Life to Live, and has since appeared in such notable films as Apocalypse Now, School Daze, all three installments of The Matrix and, most notably, played Cowboy Curtis in Pee-Wee's Playhouse. In 1999, he turned his hand to directing, adapting his stage play, Riff Raff, to the big screen, and the result is 2000's Once In the Life. 20/20 Mike (Fishburne) has just dragged a taxi driver who refused to take him to Brooklyn into a police station, but he hasn't been to see his parole officer and is thrown behind bars. There he bumps into Torch (Titus Welliver), who's just stolen a woman's purse on the subway, and realizes that Torch is his long-lost half brother. Once released, the two begin to bond, but it's not long before the volatile Torch attacks a pizza man. Mike's nickname proves to be accurate when he suddenly senses policemen approaching, and soon the two are on the lam. Both the camerawork and the mise en sc�ne are interesting and creative. Fishburne uses care in framing, as well as camera distance and movement, to comment on the action and his characters in the long dialogue sequences. In the first part of the film, there's an interesting mix of interior and exterior shots, but most of the latter two thirds is set in the hideout. It's a decaying, cluttered, graffiti-filled apartment, which seems appropriate enough, but it also contains literally hundreds of lit candles, and is bathed expressionistically in strong shades of blue, yellow, and green light, � la Trainspotting. Fishburne, with help from editor Bill Pankow, utilizes an interesting narrative strategy here. The entire "deal gone wrong" sequence is presented partially, in fragments, so an exact understanding of exactly what went down is withheld from the viewer. It's followed by long, talky sequences set in the hideout, but our natural curiosity makes us pay close attention to what's being said, in an attempt to piece together a complete understanding of what went before. But then Mike explains the whole story to Tony, accompanied by visual flashbacks, and with our curiosity now sated, the rest of the film, almost entirely set in the hideout, drags terribly until the dénouement. But Fishburne, as he reveals in the director commentary, made these choices entirely consciously. He candidly admits that the more cinematic elements of the film come primarily from director of photography Richard Turner and production designer Charley Beal, while his primary concerns were with the dialogue and the acting. It's a shame then, that Fishburne chose not to pay more attention to his actual audience than his intended audience, which he admits is only himself. Image Transfer Review: For the most part, this is a strong transfer, with vibrant colors, which is especially important given the stylized lighting scheme used for most of the interior scenes. There's a lot of detail in the image, but unfortunately in a film that contains many dark sets, there isn't much shadow detail. The one major annoyance that crops up is that any time something moves in the image, it becomes grainy, and this is definitely a compression artifact, since static objects remain crystal-clear. Audio Transfer Review: The sound is much better than the image, with a wide dynamic range, and subwoofer activity when appropriate. Much of the film is talky and there isn't a lot of surround activity, but it's there in the outdoor and action scenes. Extras Review: The full-frame theatrical trailer, which predictably concentrates on the action sequences, is presented in an okay transfer. And there's a small bonus in the form of an isolated musical score, although this isn't mentioned on the packaging. The only other extra here is the commentary by Fishburne. It's continuous, although punctuated with pauses, and he talks about the autobiographical elements in the play and movie (most of the characters were based on real-life people, and many of the locations are parts of New York where Fishburne grew up), the score and many songs, and his personal connection to many of the actors. It's an interesting commentary, both informative and candid. A drug deal goes horribly wrong, and the protagonists are forced to hole up in a decaying apartment, where the themes of friendship and loyalty are explored at (too) great length. 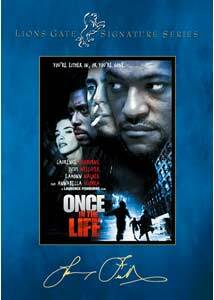 Laurence Fishburne's first film as a director is presented in a mostly good transfer.